Scotland’s rivers and lochs are one of our greatest natural assets and support a diverse array of flora and fauna. Our fish and fisheries provide a unique recreational experience, and represent a substantial contributor to the national economy. They are a crucial link in Scotland’s ecology and are embedded in our culture. It is vital that we protect, enhance and conserve them. Scotland has many thousands of miles of rivers and these provide a natural and sustainable environment to which our native, wild salmon and sea trout return from their marine feeding grounds. 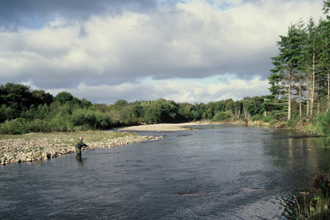 These rivers are renowned worldwide for supporting economically important and environmentally sustainable fisheries for anglers – they provide a wealth of opportunity for anglers to fish for these sporting species. Contrary to popular belief, much of the available fishing is accessible at modest cost, and there is fishing to suit anglers of all ages, ability and financial means. The affordable fishing pages, developed by ASFB (and soon to be updated) highlight some of the affordable and accessible salmon and sea trout fishing in Scotland. The emphasis is on fishing that is not simply cheap, but those that represent good value with a reasonable prospect of fish being present and caught. Good value is difficult to define, as this means many things to many people. However, we highlight fishing that should be affordable to many anglers, both locals and visitors to Scotland. Many of these moderately-priced and accessible fishings are very productive, for example it is estimated that 15-20% of the national salmon rod catch in Scotland is made from angling association waters controlled or fished by clubs and associations. As with many other recreational and sporting activities, and to a degree dictated by supply and demand, some salmon fishing at the top end of the market will always attract a premium cost, and this is what tends to reinforce a general perception that salmon fishing is to be beyond the reach of many anglers. Just as you would expect to pay more to watch a football team in the Champions League Final, than you might in their domestic league, the same principle applies to salmon fishing. It should also be noted that there are a large number of informal arrangements throughout Scotland whereby affordable and publically accessible fishing is offered. Many of these are not captured by the database within this site. Please remember that our site is not a commercial marketing tool for individual fisheries, nor is it a place to purchase permits. It is intended to provide facts and help guide anglers to good value fishing availability and to provide the relevant information to allow you to make an informed choice. We also hope that it will highlight, in a national sense, that salmon and sea trout fishing is an activity that can be enjoyed by all.